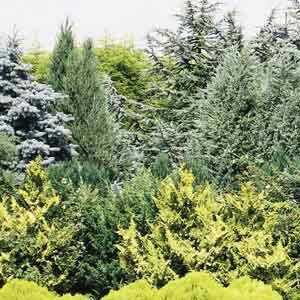 The majority of coniferous (cone bearing) plants in the marketplace are evergreens with needles, making them prime selections for providing year round color and texture in the landscape. A wide range of sizes, shapes and foliage colors are available; all of course, with attractive cones. Tolerates poor soil, heat, and drought. Best in fertile, well-drained soil. Keep soil moist, watering freely in dry weather. Apply a summer mulch to retain moisture. Prune back early each spring for best display.